This literature review aims at summarizing the state of knowledge related to small urbanised settlements. The significance of researching these localities can be inferred from the fact that a growing share of urban population lives in such agglomerations with a population above 10,000 and below 50,000 to 100,000 inhabitants. This fact is not limited to India and a large share of the urban population worldwide lives in small and medium cities, which are understudied. 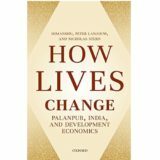 The same dearth of research applies to the Indian context, as will be evident in this review, despite the importance of the resilience of an urban system comprising a large number of small towns and the diversity of these settlements in terms of their economic base and their social structure. This literature review is structured around five themes: A) the first section lays out issues related to estimating the magnitude and sources of demographic growth in order to infer the contribution of small towns to urban dynamics; B) the second section on Small Towns: Sources of Growth explores the economic processes supporting the expansion of small towns, and debates the dominant vision of the relationship between urbanization and growth, as explained by the New Economic Geography; C) the third section focuses on the transformation of small town economies and social structures while examining practices of entrepreneurship, circulation of labour, social mobility as well as caste and gender inequalities; D) the fourth section on Land and territorial transformations focuses on the relation between property and entrepreneurship; and E) the last section on Governance makes sense of the literature on decentralization, government schemes, governance and the political economy of small towns. This review constitutes one of the steps undertaken within the Subaltern Urbanization in India project (www.suburbin.hypotheses.org) to bring back to the fore the research on small towns.